Providing you the best range of soya chunks with effective & timely delivery. Our offered Soya Chunks is prepared from high-grade defatted soybean flour in hygienic industrial environments. These Soya Chunks are highly recommended for cardiac & diabetic patients, expectant mother, growing children and elderly persons. Rich in natural minerals and proteins, our product provides a nutritious and balanced diet required by a human body. 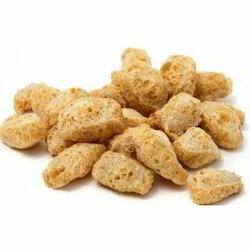 Looking for Soya Chunks ?